It is a gray, windy day in early February. Elderly people – alone or in small groups, men and women – exit the low building of the municipal canteen of Krasna Polyana, one of the municipalities of Sofia. They zig-zag slowly through the dark puddles after claiming the meal of the day: bean soup and stew. "I have been coming here for a couple of years, it is a major help. Life is not easy". Stoymen Stoymenov, 64, speaks quietly, articulating every word. "I have worked all my life as a driver, but ten years ago I lost my job, and with time also the hope to find a new one. I have not yet reached retirement age, which is 65, so I have no income. If not for my children, I would not know what to do". Stoymen's story is common to many elderly Bulgarians: although he worked for 40 years, his pension contributions are halved by long periods of informal work. The last company he worked for went bankrupt, "and with the company gone, so were my employment papers", he adds, taking out a pack of cigarettes from his crumpled jacket. "But even when I have the long-awaited pension, my life will change little: what can I do with 150 levа (75 Euros) a month?". According to Eurostat data published on October 1st, 2015 (referring to 2014), Bulgaria is the EU country with the highest proportion of elderly people at risk of poverty and social exclusion (58%). 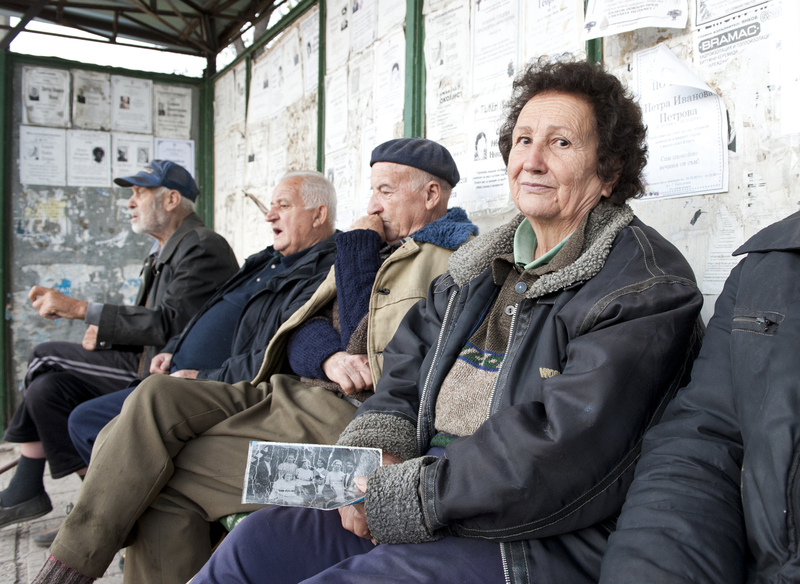 According to the study, 51% of Bulgarian citizens over 65 face serious material difficulties. An analysis of the Institute for Market Economy (IPI) in Sofia (2013 data) shows that 28% of the elderly live in poverty, with 8% in extreme poverty. "Compared to many EU countries, Bulgaria's issue is not so much economic inequality, though it does exist, but rather absolute poverty, the inability to maintain minimum living standards", explains to OBC Petar Ganev, IPI economist. "According to our data, children are most at risk, closely followed by the elderly. Poverty in old age, however, is the most difficult to fight: those who become destitute after their working age are usually destined to remain so". As the only source of income for many, pensions are the most important tool to combat poverty among older people – without them, the percentage of over-65 poors (respectively 25.2% for men and 28.1% for women) would be dramatically higher (40.4% and 43.1%). However, the picture is bleak. According to data by the Bulgarian National Social Security Institute (NOI), at the moment there are 2.200,000 pensioners in Bulgaria. The average pension in the country amounts to 320 levа per month (160 Euros), slightly above the poverty line set at 286 levа (145 Euros). About a quarter of pensions, however, barely reaches 200 levа (100 Euros), with minimum pension at 155 levа (80 Euros). "Retiring in Bulgaria equals impoverishment and loss of economic and social status – therefore, those who can continue to work even after retiring", stresses Ganev. "The problem is that the system, already in trouble, is weighed down by too many 'baby pensioners' and the many disability pensions paid without controls. And so there are fewer resources for those who really need them". According to data presented in October by welfare expert Mika Zaykova, Bulgaria is the EU country in which pension is the most drastic reduction in income compared to the previous salary: 65% for those born before 1960, 58% for those born after. "Today there is much talk of lack of solidarity between generations, with young people abandoning their elders. I do not think that is true", says Ganev. "What is certain is that the economic transition led to a significant loss of capital accumulated in the past decades, in a confusing context that favoured embezzlement. Members of today's active generation must support themselves, build a future for their children and also take care of the elderly". Zaykova's position is much more critical. "Today's retirees are heroes – they have gone through the devastating change of regime, and despite everything they have survived and keep giving their contribution", said the expert in an interview with Darik Radio. "We abandoned entire generations to abject poverty, destroying social relations and solidarity and condemning thousands of families to isolation". Demographics does not help either. According to Eurostat, Bulgaria is one of the countries with the highest rate of aging: in 2080, the over-65 will represent 30% of the population (in 2014 the percentage was slightly below 20%), while the over-80 will be the 12.4% (4.4% in 2014). This, despite Bulgaria being one of the EU countries with the lowest life expectancy, 71 years for men and 78 for women (2013 data). "In addition to poverty, older people in Bulgaria experience isolation, alienation, and marginalisation. The situation is especially dramatic in cities, in the absence of the neighbourhood networks typical of smaller centres". Vanya Klecherova coordinates the social campaigns of Caritas Bulgaria. One of the most important projects, devoted to poverty in old age and care at home, has been active in many cities and smaller towns for over 13 years. Not even technology helps overcoming isolation. Bulgaria's elderly are lagging behind the EU for the use of the Internet too: only 10% has access to the web. "Unfortunately", explains Klecherova to OBC, "many older people are forgotten by society, and only remembered during the election period or in census time". In Sofia, with a Caritas mobile team, we visit a few of the over 400 elderly in the care of the organisation. Emiliya Dabizheva lives in one of the many anonymous "bloks" of the Hadzhi Dimitar district. A former specialist in the field of nutrition, she was for years head of catering at the Palace of Culture (NDK) in Sofia, the largest convention centre in the Balkans, and then taught "Organisation of Tourism" at the Sveti Kliment Ohridski University of Sofia. Because of a disease that confined her to a wheelchair, she had to give up work after 22 years of contributions, and now receives a disability pension of 320 levа (160 Euros) per month. "If I did not live with my daughter, I'd be in dire poverty. The pension barely covers the ongoing costs, heating, electricity, and water. What is left is just enough to survive. What hurts the most, however, is the condition of retired and invalid. The health insurance fund only covers minimum fees, and often the medical staff demands bribes for services that I am fully entitled to. For those in wheelchairs, then, Sofia is a big prison – not even institutional buildings are accessible. I haven't been able to attend a cultural event for years. For society, today, I am absolute zero".